Home • Studies • Minimum Wage • Fighting $15? Click here for a policy brief of the book's findings. In his 2013 State of the Union, President Obama called for a 25 percent increase in the federal minimum wage, to $9 an hour. Five years later, the Democratic Party promised a minimum wage increase of more than 100 percent, to $15 an hour. This radical evolution in what constitutes an acceptable minimum wage can be credited to the Service Employees International Union (SEIU), which starting in 2012 invested more than $100 million to normalize the concept of a $15 minimum wage. The SEIU has succeeded in its political goal; today, anything less than a demand for a $15 minimum wage is considered unacceptable to organized labor, and the Democratic Party has adopted the policy as part of its national platform. But political success doesn’t translate to economic success, and the $15 experiment has a more-mixed record on this point. 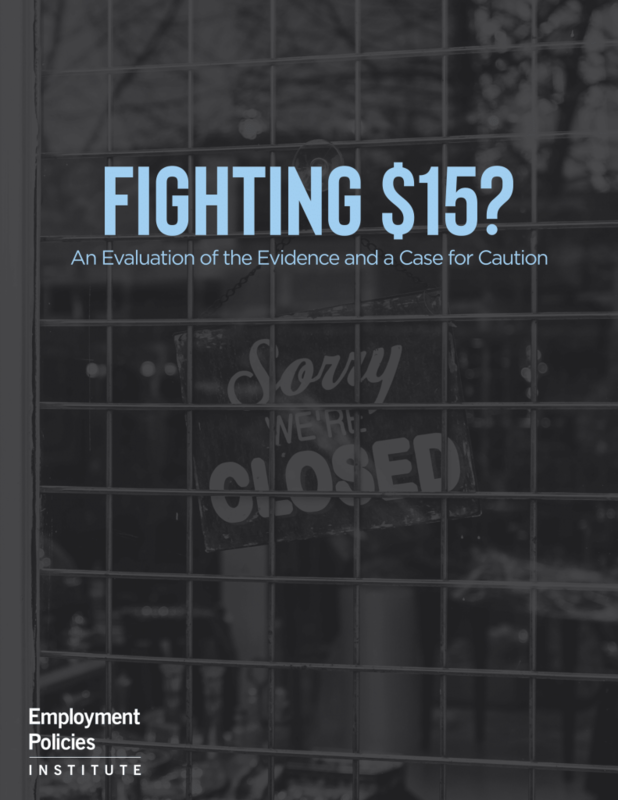 A 2017 analysis from researchers at Harvard and Mathematica Policy Research, covering more than a dozen cities in the San Francisco Bay Area, found each $1 increase in the minimum wage was associated with a 14% increase in closures for median-rated restaurants. In Seattle, a team of researchers at the University of Washington identified a significant loss of work hours for affected employees, such that workers who were supposed to gain a boost in pay were instead no better off than before. These consequences shouldn’t come as a surprise, given the lack of precedent for a minimum wage as high as $15 an hour. The first federal minimum in 1938 was $0.25 an hour, or $4.20 in 2015 dollars. It began primarily as a skilled minimum wage, applied to industries such as mining, manufacturing and transportation. As it expanded to include jobs in the service industry, the minimum wage in effect became a wage floor for unskilled labor. Adjusted for inflation, the federal minimum wage has been as high as $10.90 an hour, in 1968, and as low as $3.93, in 1948. But the average federal minimum wage over its 80-year history in the U.S. has been $7.40 an hour--roughly half of the proposed $15 standard. As this book describes, moving to a $15 standard would expand coverage of the minimum wage to a level previously unheard of. Today, less than 3% of the hourly workforce earns the minimum wage; by contrast, a $15 minimum wage would cover 44% of the hourly workforce in 2020. Considering that minimum wage coverage has historically ranged from 1.5 to 4 percent of this workforce, this figure should rightly shock members of Congress considering whether to support $15. The President took their advice, but the 40-percent increase did eventually pass in 2006, and it phased in between 2007 and 2009. Subsequent research has shown that the increase worsened the effects of the Great Recession; according to one study by economists at the University of California-San Diego, this federal wage hike was responsible for 14 percent of the decline in employment during the recession. The Congressional Budget Office warned that raising the federal minimum wage by another 40 percent (to $10.10) would cost the country an estimated half-million jobs. Should a $15 minimum wage be pursued, this book suggests as many as 2 million jobs. That figure could be conservative, as it doesn’t account for the impact of a sharp 604-percent increase in the minimum wage for tipped employees that’s been embraced by organized labor. Currently, tipped employees are guaranteed the same minimum wage as all other employees; with their tips, they report earning more than $14 an hour on average. A New York-based labor group called ROC has spent millions of dollars advocating to eliminate the tipping system in favor of a higher flat wage. Most tipped employees are strongly opposed to this change-- one survey found that 97 percent prefer the status quo- -and have organized against ROC’s efforts to change it. More than their income is at risk: One study looking at past changes in the tipped minimum wage found an industry-wide decline in employment associated with each tipped wage increase. The best case against a higher minimum wage might be its irrelevance. Since the last increase in the federal minimum wage was fully phased-in in 2010, both the number and percentage of people earning it has fallen every year, as employees earn raises through their own initiative. Multiple studies confirm that a majority of minimum wage employees--who are disproportionately young and less-educated--earn a raise within one to 12 months on the job. For employees who are older and/ or have children, better alternatives exist--including the Earned Income Tax Credit, which operates through the tax code instead of a mandate on employers. Thanks for the EITC (also called the Working Americans Credit), the effective federal minimum wage for many single parents is already above $10 an hour. There’s a strong case for caution on a $15 federal minimum wage. The question is, will Congress heed the evidence?